Few people can argue that immigrating to a new country is both an exciting and difficult experience. Whether a person leaves his or her homeland because of political or social unrest or simply for the adventure of carving out a new life for one's self and family, the journey is often filled with questions and expectations. However, when that journey ends in the United States, the immigrant often finds that rather than ending, the path to a new life has just begun. Many immigrants view American society and culture with unrealistic perceptions that riddle the transition to American life with frustrations and despair. While many organizations strive to help immigrants adjust to life in America, the fact is that immigrants are unprepared and under-educated about American life. As a result, they are unable to adequately deal with the feelings they have when they arrive, namely dealing with adjustment disorders and anxiety reactions. 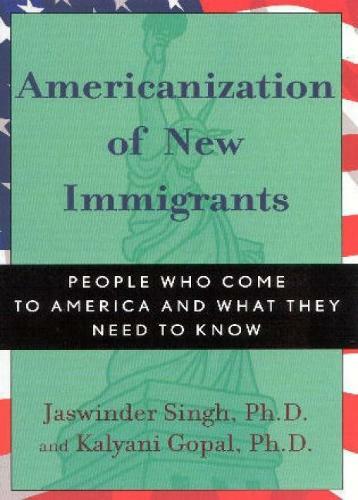 Americanization of New Immigrants is a heartfelt and informative book that details how American society works and how immigrants need to prepare for the societal and cultural changes they are about to experience.